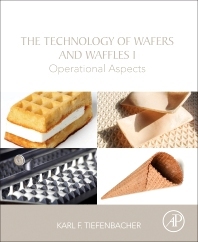 The Technology of Wafers and Waffles: Operational Aspects is the definitive reference book on wafer and waffle technology and manufacture. It covers specific ingredient technology (including water quality, wheat flour, starches, dextrins, oils and fats) and delves extensively into the manufacturing elements and technological themes in wafer manufacturing, including no/low sugar wafers, hygroscopic wafers, fillings and enrobing. The book explains, in detail, operating procedures such as mixing, baking, filling, cooling, cutting and packaging for every type of wafer: flat and shaped wafers for making biscuits, ice cream cones, cups, wafer reels, wafer sticks (flute wafers) and biscuit wafers. It also explores the various types of European (Belgian) waffles and North American frozen waffles. Karl F. Tiefenbacher was Head of the Franz Haas Bakery Technology Centre for 26 years and spent 14 years in Research and Development in the food industry. He has handled more than 300 troubleshooting tasks in Bakery Technology worldwide and provides recipe consulting and development for many companies across the globe. He has conducted trainings in wafer, waffle, and biscuit technology for operators, technologists, and owners, and has given assistance in equipment selection and commissioning.